Doe Bay Fest is only six years old, but with its stellar record for booking the best of the Northwest, it has already become legendary. Festival-goers recognize each other on the street and nod – “Doe Bay?” “Doe Bay” – like members of a secret society sharing a password. This was my first year at Doe Bay, and because of the type of writing I do for a living, I wanted to tell you how to score tickets to Doe Bay Fest, which always seems to sell out before tickets go on sale. 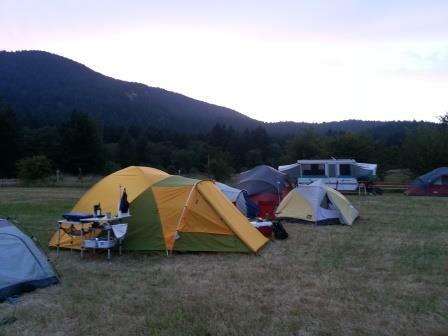 I planned to describe the camping areas and give advice about meal planning and festival food. But now that I’ve been there, I’m not going to write any of that. Yes, there is a secret to getting tickets that may or may not involve blood sacrifice. Where your tent lands does define your weekend. My family had a couple of excellent meals, and yet never quite managed to eat enough food soon enough to keep everyone from getting cranky. And that will probably happen next year too. Because when it’s time for Doe Bay, everyone turns toward the Island like birds following the call to migration. 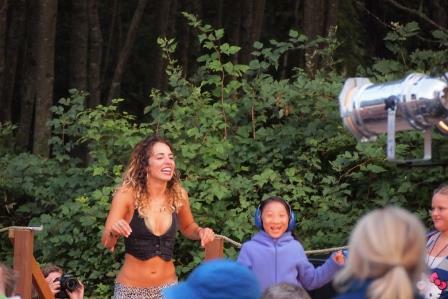 There is a truly remarkable vibe at Doe Bay. Hipsters are thick on the ground, but for every ironic mustache there are several parents too busy chasing toddlers to change clothes daily. Somehow everyone just gets along. It’s like a family reunion where emotional baggage has been replaced by amazing music. The beautiful location and relaxed atmosphere don’t eliminate the inconveniences of camping with children at a music festival. They just set the stage for moments that will far outlast the hassles in memory. 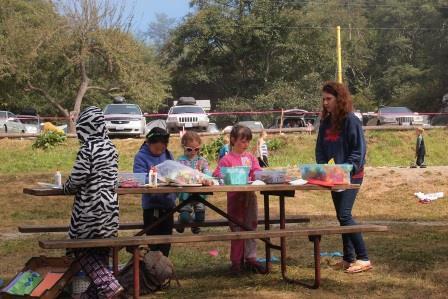 Early Friday afternoon, the kids were making friends and rainbow streamers at the craft table. I wandered alone to Otter Cove stage, a miniature Gorge at George overlooking the titular Bay. I had no particular expectations for the band; I just hate missing music I’ve paid to hear. The announcer welcomed You Me & Apollo, all the way from Colorado. Reclining in the sunshine, everyone clapped politely for the long commute of the nondescript-looking band, who took the stage – and let loose with a blazing set of bluesy rock and roll groove with the voice of Steven Tyler. You know that euphoria when you’re blindsided by your favorite new band? How about when 300 people have that moment with you? Midway through the second song, the whole audience jumped off their blankets and rushed forward, dancing and hooting through the rest of the set with a level of enthusiasm usually reserved for many hours and beers later in the day. The scrawny singer in trucker clothes jumped off the stage and slid down the hill on the heels of his cowboy boots, ending the set with a round of high fives with the front row. My daughter was enjoying Grizzled Mighty as much as I was, so near the end, I led her to the front of the crowd. Actually, the crowd parted like the Red Sea in front of my daughter – kids are VIPs at Doe Boy. Bare feet firing the kick drum, right arm hitting the cymbal like a backhand, Whitney tipped her head back and swallowed a slug from a can of beer. Without losing time, she flung the can over her shoulder. An arc of foam spread out behind the can in the air over her head. 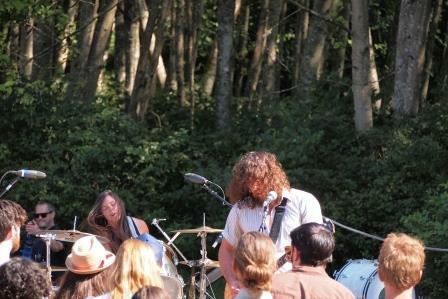 When Fly Moon Royalty took the stage, my daughter disappeared in the crowd. I tried not to cringe when Adra said, “Sorry, but kids, this song is going to teach you how mommy and daddy met – and came to have you.” I figured that if a little kid got hurt up front, a crowd this friendly would help her out, but as the energy built, I couldn’t help but be nervous. I imagined the headlines “Mom Loses Child at Concert,” and incensed Seattle readers turning to each other over coffee and huffing, “What kind of a mother even takes a little girl to a Fly Moon Royalty show?” Then the Daddy said, “There she is!” I scanned the field for the prodigal daughter. Adra Boo said, “Give it up for the Doe Babies!” and there was the daughter, in a group of little girls dancing on stage. Do I even need to mention that Fly Moon Royalty is on the home stereo as I type this? 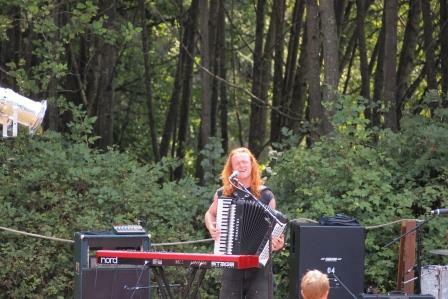 Saturday afternoon, I got a real kick when an apparent metal head with long red hair and black sleeveless tee wandered on stage, and picked up an accordion for Animal Eyes’ set. The music was as unexpected as the accordion/keyboard player, and I will definitely be checking out this group out more closely. But the real Moment happened hours later. Standing in line in the beer garden I noticed two men juggling. It was the accordion player and the sweat-banded guitar player from Animal Eyes. Alaskans really are different. Saturday night, I’m reading bedtime stories when Built to Spill starts their headlining set. Eventually, the beyond tired kids fall asleep, and I lie in my sleeping bag next to them, listening to the trippy, fuzzed out festival climax. From inside a tent in a field at the neighboring farm, it sounded pretty good. We’ve been parked in line at the ferry terminal for three hours, with almost another hour before the 2:20 ferry back to Anacortes. The kids are tired and restless. We are tired and restless. Suddenly, there is music. 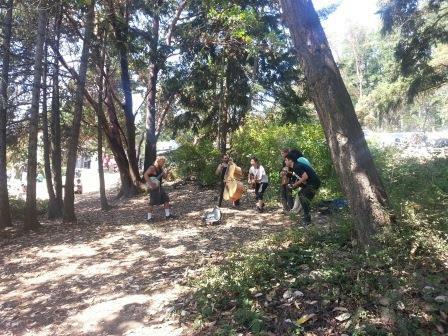 We follow the sound to a grove of trees where a mulleted man with lambchop sideburns is playing banjo. There’s a guy on standup bass beside him, others on washboard, mandolin, and ukulele. A crowd gathers. Without prompting, our girls drop all their money (12 cents collected from scanning the ground around the ferry all morning) into the open guitar case. The Rusty Cleavers didn’t play Doe Bay. I don’t know if they even attended the festival, but as the arrival of the ferry broke up their set, it felt like a Doe Bay Moment to me.